Latest genome-wide annotation studies based on high-throughput transcriptomics from single cell embryo to differentiated tissue cell types reveal that more than two-thirds of the mammalian genome is transcribed encoding tens of thousands of different classes of small and long noncoding RNA (lncRNAs). lncRNAs represent largest class among the ncRNA subtypes and according to the GENCODE (v27) latest estimates the human genome (hg38) contains about 27,908, whereas according to NONCODE (v5) predicts 1,72,216 transcripts, which outnumber the protein coding RNAs. lncRNAs, which are more than 200 nucleotide in size, do not produce any proteins but have been shown to perform extremely important biological functions as RNA molecules. lncRNA once thought as a part of transcriptional noise, now found to play an important regulatory role in the transcriptional and post-transcriptional gene regulation in important biological functions such as X-chromosome inactivation, genomic imprinting, nuclear/cytoplasmic protein trafficking, mRNA/protein stability and mRNA splicing. While it is relatively easy to identify transcribed lncRNAs, it remains a major challenge to characterize their functions. Thus there is a need to identify biologically relevant lncRNA with functional roles in cell differentiation, development and disease. To address this, we use novel high-throughput screening approaches to identify functional lncRNAs involved in tumor development and progression. We are on the verge of characterizing their molecular functions and demonstrate the functional relevance of these lncRNAs in tumor development and progression using different cell lines and animal model systems. We also expect to identify lncRNAs that can be used as biomarkers for human disease and as novel targets for future drug development. The following are the functional screens that we are currently using to identify biologically relevant functional lncRNAs. Chronic cell proliferation is considered one of the important features of cancer. Cell division cycle plays a critical role in the regulation of normal and chronic cell proliferation by responding to cell cycle regulators (cyclins, cyclin dependent kinases (CDKs), growth factors, growth suppressors, tumor suppressors and oncogenes). Cell division primarily comprises two phases: the DNA synthesis (S) phase and the mitotic (M) phase. The pathways that control DNA synthesis or replication during S-phase are critical for normal cell proliferation, as errors during DNA synthesis could result in abnormal cell proliferation. Importantly, replication occurs during different stages of S-phase. For example, replication of active chromatin regions occurs during S-phase whereas that of heterochromatin or repressive chromatin regions occur during late S-phase. Thus, characterization of mechanisms that control S-phase progression would allow us understanding the role of S-phase in normal and disease conditions. In comparison to protein-coding genes, the role of lncRNAs in S-phase regulation is still poorly understood. To explore the functional role of lncRNAs in S-phase progression, we need to produce time resolved transcription maps covering early, mid and late stages S-phase. To this end, we have adapted a real-time strategy "Nascent RNA Capture assay", whereby we can capture the ongoing transcription of lncRNA with high turnover in different compartments of S phase. The EtU labeled RNA along with unlabeled total RNA, representing steady state levels, collected at early, mid late stages of S phase, are subjected to deep sequencing. By applying state of the art computational tools on Etu labelled and unlabelled steady state RNA levels from early (T1), mid (T2) and late (T3) S-phase stages and unsynchronized HeLa cells, we identified 1,145 S-phase-specific temporally expressed lncRNAs. By analysing their expression levels in 6,419 solid tumors and 701 normal tissue samples from The Cancer Genome Atlas database covering 16 cancer types, we identified 570 differentially expressed lncRNAs at least in one cancer type. Likewise, our systematic and detailed clinical investigation using 14 cancer types, identified 633 independent prognostic markers. These S-phase-specific cancer-associated lncRNAs (SCATs) would serve as huge resource to explore their functional role in tumor initiation and development. 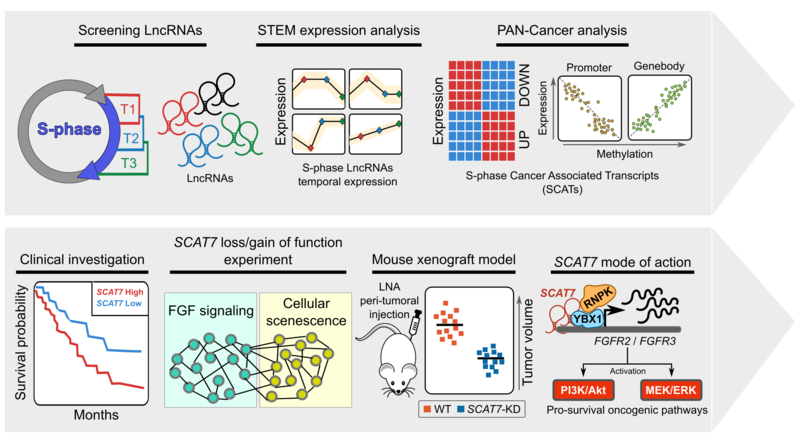 Our detailed mechanistic investigations on one of the SCATs SCAT7 revealed that it is oncogenic lncRNA, which interferes with all well characterized cancer cell hall marks. Subhash S, et al. Extra view: S-phase Cancer Associated lncRNAs. Cell Cycle 2018. Ali MM, et al. PAN-Cancer analysis of S-phase enriched lncRNAs identifies oncogenic drivers and biomarkers. Nature communications 2018;9;1. Meryet-Figuiere M, et al. Temporal separation of replication and transcription during S-phase progression. Cell Cycle 2014;13;3241-3248. CASC15: By analysing the RNA-sequencing data of high- and low-risk neuroblastoma tumors we identified several differentially expressed lncRNAs. Some of the top differentially expressed lncRNA genes (NBAT1, CASC15 and its isoforms CASC15-003 and CASC15-004) map to the neuroblastoma risk-associated locus 6p22.3. Several single nucleotide polymorphisms located in the 6p22.3 locus were implicated in the metastatic high risk neuroblastoma by genome wide association studies. However, lack of any known protein coding gene in this locus made it challenging to functionally characterize the locus. We found that both NBAT1 and CASC15 (CASC15-003 and CASC15-004) are pro-neruogenic lncRNAs with high expression in Neural Crest (NC) cells and their deficiency blocks differentiation of both NC and neuroblastoma cells. Consistent with their role in neuronal differentiation lower expression of 6p22.3 lncRNAs correlates with poor prognosis of neuroblastoma patients. Based on our published evidence, NBAT1 and CASC15-003 share similar mechanisms that underlie tumor suppression. We have shown that NBAT1 and CASC15-003 interact with a deubiquitinase protein USP36 and regulate the nucleolar localization of USP36, thereby interferes with the proteasome mediated degradation of chromatin remodeller CHD7. 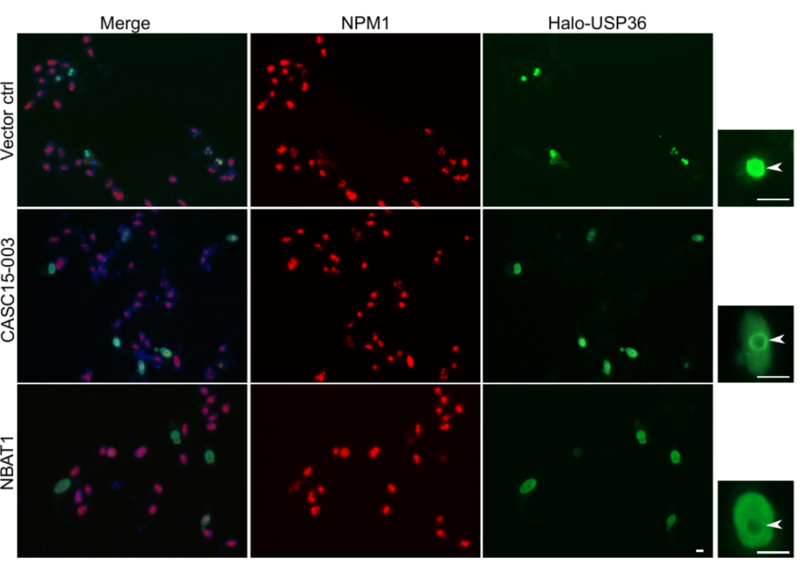 During differentiation of neuroblastoma cells spatial distribution of USP36 is altered: nucleolar localized USP36 gets dispersed in the nucleus but in the neuroblastoma cells lacking NBAT1 and CASC15-003, USP36 remains in the nucleolus. 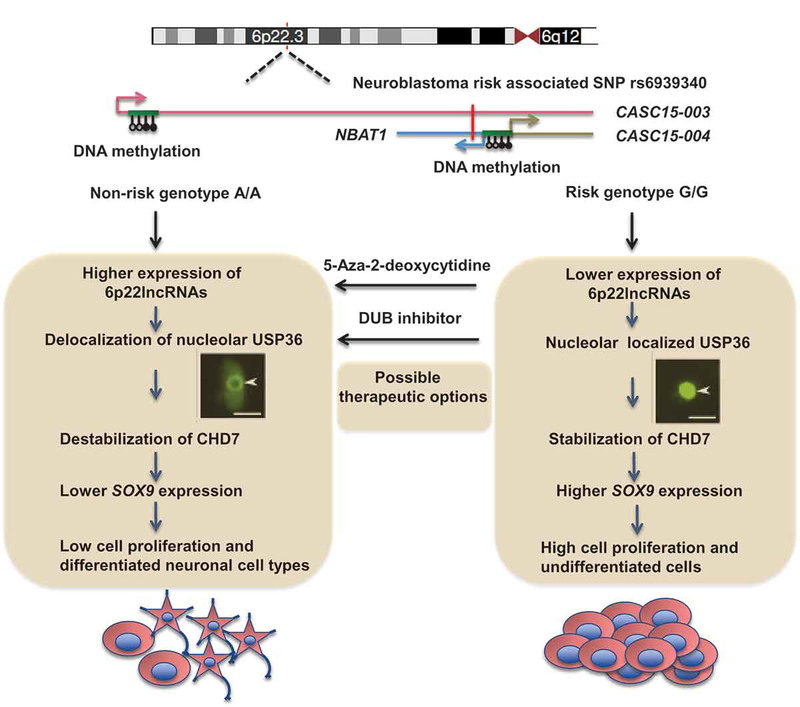 Nucleolar USP36 promotes CHD7 stabilization which activates the expression of pro-tumorogenic genes including SOX9. 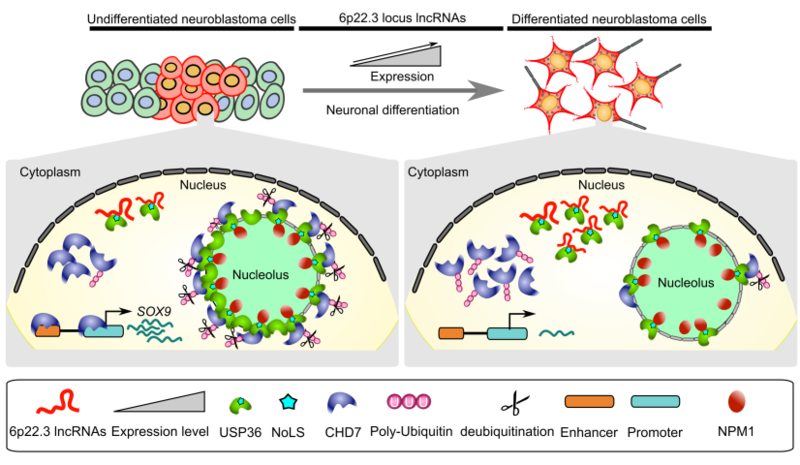 Mondal T, et al.Commentary: LncRNAs join hands together to regulate neuroblastoma progression. Molecular & Cellular Oncology 2018. Mondal T, et al.Sense-antisense lncRNA pair encoded by locus 6p22.3 determines neuroblastoma susceptibility via USP36-CHD7-SOX9 gene regulatory axis. Cancer Cell 2018. NBAT-1 is differentially expressed between low and high-risk tumors. Its lower expression correlates with poor prognosis in neuroblastoma patients. It controls neuroblastoma progression through regulating pathways implicated in cellular proliferation, invasion and neuronal differentiation. Model explaining the tumor suppressor and neuronal differentiation properties of NBAT-1. NBAT-1 functional interaction with EZH2, a member of PRC2 complex, controls tumor progression by suppressing protumor genes such as SOX9, VCAN, and OSMR via regulating chromatin structure. On the other hand, NBAT-1 promotes neuronal lineage commitment by suppressing NRSF/REST by interacting with an unknown neuronal-linage-specific transcriptional repressor. 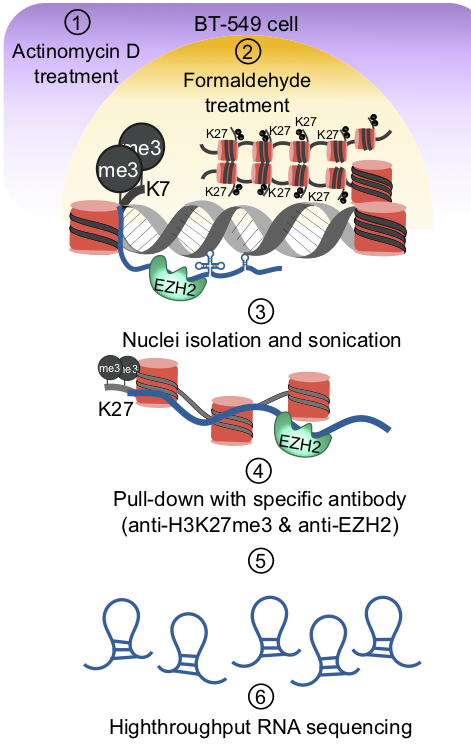 The NBAT-1/EZH2 interaction has no functional role in the repression of NRSF/REST. Pandey GK, et al. Review: Long noncoding RNAs and neuroblastoma. Oncotarget 2015. Pandey GK, et al. 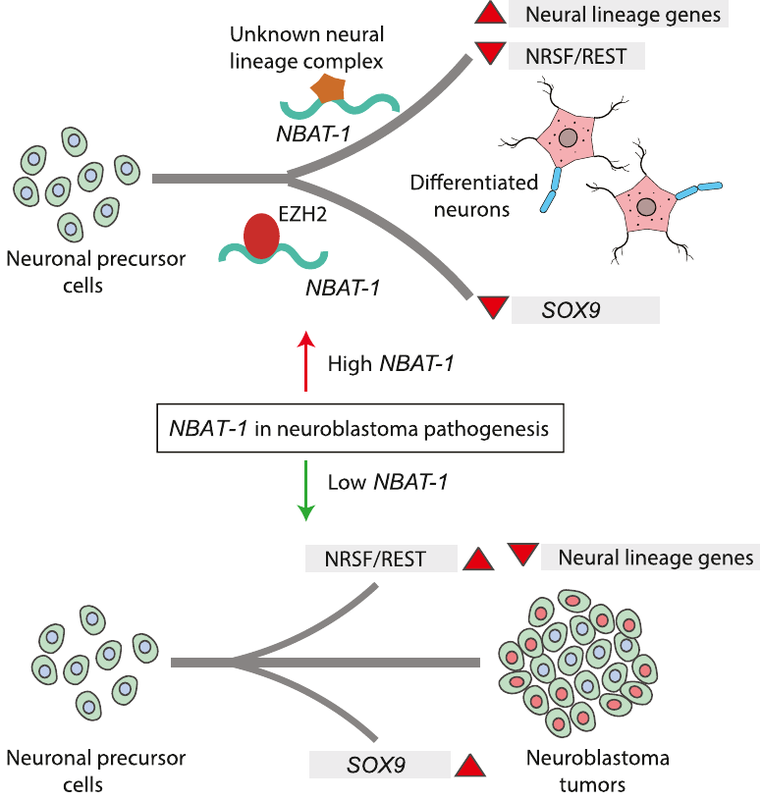 The risk-associated long noncoding RNA NBAT-1 controls neuroblastoma progression by regulating cell proliferation and neuronal differentiation. Cancer Cell 2014;26;722-737. Using chromatin as a substrate lncRNAs have been shown to mediate epigenetic modifications for transcriptional regulation of gene expression. LncRNAs have the ability to both interact with and recruit chromatin modifying enzymes to catalyse the epigenetic modifications. Over the last few years, we have been trying to characterize RNAs that are part of chromatin, in particular we are interested in understanding how they are targeted to chromatin and what kind of functions chromatin bound RNAs have in gene regulation. We had previously used sucrose gradient purified chromatin to isolate chromatin bound lncRNAs and subsequently we have standardized a technique called chromatin RNA immunoprecipitation (ChRIP) to characterize the lncRNAs associated with inactive chromatin compartment as defined by distinct histone modifications. Mondal T, et al. Chromatin RNA Immunoprecipitation (ChRIP). Book: Methods in Molecular Biology: Chromatin Immunoprecipitation. 2018;65-76. Inactive lncCARs: Characterization of global inactive chromatin associated lncRNAs (Inactive lncCARs) from our studies suggest that they have a broader role in both cis and trans gene regulation. We are currently focusing on characterizing the regulatory function of these CARs and used them as tool to understand of the biology of inactive chromatin bound lncRNAs. In this study, we found that how chromatin-interacting sequences of MEG3 lncRNA-containing GA-rich sequences form RNA–DNA triplex with the GA-rich DNA sequences to guide MEG3 lncRNA to chromatin. PRC2-interacting sequences of MEG3 lncRNA facilitate recruitment of the PRC2 to distal regulatory elements, thereby establishing H3K27me3 marks to modulate gene expression. Mondal T, et al. MEG3 long noncoding RNA regulates the TGF-beta pathway genes through formation of RNA-DNA triplex structures. Nat Commun. 2015;6:7743. Active lncCARs: Characterization of global active chromatin associated lncRNAs (Active lncCARs) from our studies suggest new facet of chromatin-based regulation at the divergent XH transcription units by this newly identified class of H3K4me2/WDR5 chromatin enriched lncRNAs. 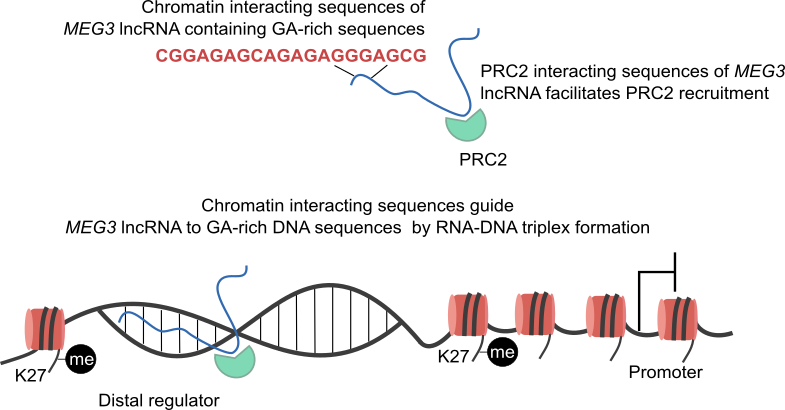 figure: Model depicting transcriptional regulation of divergent gene loci by active XH lncCARs. In this study, we found that active XH lncCARs transcribed from divergent transcription units are targeted to specific regions around TSS of partner protein coding gene that are enriched with H3K4me2, through their chromatin interaction property. Promoter targeting of these active XH lncCARs helps in maintaining H3K4me2 in WDR5 independent manner. 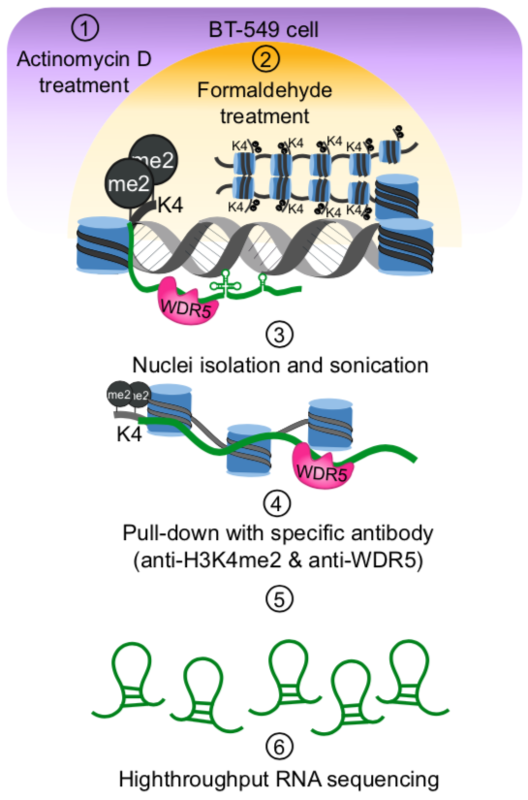 XH lncCAR-dependent recruitment of WDR5 at the active XH transcription units helps in the conversion of H3K4me2 into H3K4me3, thereby establishing transcriptionally competent chromatin at the divergent transcription units. Subhash S & Mishra K, et al. H3K4me2 and WDR5 enriched chromatin interacting long non-coding RNAs maintain transcriptionally competent chromatin at divergent transcriptional units. Nucleic Acids Research. 2018;gky635. Last modified: December 17 2018.